Welcome to USDeclarationOfIndependence.com, the first fifty years. Collecting early works reprinting the Declaration is fun, challenging, and potentially rewarding — works reprinting the Declaration command increasingly higher prices. Over 100,000 books, pamphlets, and periodicals were published from 1776–1825. Yet, a mere 358 reprint the text of the Declaration. Two-thirds of these works do not mention the Declaration in their titles. Understandably, locating or accessing these works has been difficult...until now! Just Published. A Checklist of Books, Pamphlets, and Periodicals, Printing the Declaration of Independence, 1776–1825. With an appendix checklist of American newspapers printing the Declaration of Independence. Reserved: This space will be used to report the discovery of works reprinting the Declaration not cited in the Checklist or in the Additions and corrections to the checklist. On July 4th, 1776, Congress adopted the Declaration of Independence. That night Philadelphia printer, John Dunlap, printed an estimated 200 copies of the Declaration in the form of a broadside. 26 copies of The Dunlap broadside are known to have survived. (The 26th copy was discovered in October 2008 by rare book dealer Joseph Felcone of Princeton, NJ, while at the National Archives of the UK, in London, working on a descriptive bibliography of 18th-century New Jersey printing.) On July 19th, 1776, Congress ordered the Declaration engrossed (hand-inscribed) on parchment by Timothy Matlack, and to be officially titled The unanimous Declaration of the thirteen United States of America. On August 2nd, 1776, The unanimous Declaration was signed by most of the delegates. Others signed later. Win a Free Hardbound Book. The author solicites, from the public, titles of works printing the full text of the Declaration, in English, which are not in the Checklist. The author can be contacted via email by clicking on Contact Me. The author will add new checklist entries and make corrections to the Checklist in an evolving document called Additions and Corrections to the Checklist, which can also be downloaded from this website in PDF format at no cost. 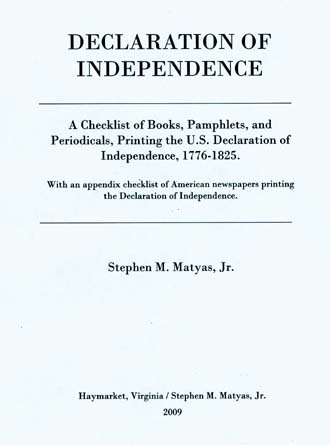 For those who locate a book, pamphlet, or periodical, printing the full text of the Declaration of Independence, in English, not already cited in the Checklist or the Additions and corrections to the checklist, the author will award (while quantities last) a hardbound copy of the Checklist.